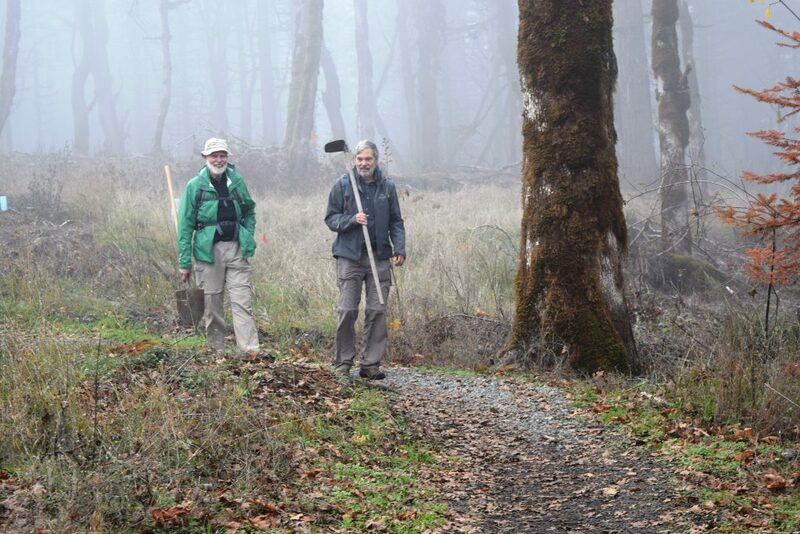 GLT volunteers, Larry (right) and Clayton, keep Mulkey Ridge trails in great condition. I am hiking eastward on the low ridge of Mulkey Creek Trail. It is a blustery day with passing gusty showers and no sunbreaks, yet there are people on the trail. With the lousy weather, the hikers seem to be even more friendly than usual as if we are in this together. Although not dangerous, the storm is hard to ignore and you do not need meditation skills to clear your mind. I enter the restored oak savanna which provides an extended view and glimpses of the farmland below. As I walk along the meandering trail, I do not try to identify plants or even notice the details, but rather sink into the mood of the woods as if viewing an impressionistic painting, supplemented by the sounds of the woods. At the moment, I hear mainly the wind in the trees and a lone raven that seems to be escorting me out of his/her territory. The raven leaves me as I descend down the little switchbacks toward Mulkey Creek. This used to be a destination mud challenge but now the trail is solid and wide with good traction. More than once I have seen baby buggies pushed up the switchbacks in mid-winter. As I emerge from the woods, I notice Corvallis in the distance. I think of European paintings of several hundred years ago with someone traveling on a track that descends from hilly forests down to valley farmland surrounding a village. I imagine that in an hour I will enter the village, find an inn, sit by the fire with my beer and hot stew, chat with the innkeeper a little bit and then head up to my room and slip my tired body into bed. I preserve this image a little longer by trying to ignore the OSU smokestack and Reser stadium sticking up in the middle of the distant village. I then acknowledge reality and start thinking of the latte that I will fix after I get home and into dry clothes. I always enjoy hiking in the rain especially after I get past the first couple of minutes and my blood starts circulating. And when I get home, I do not have to worry if there will be room at the inn.